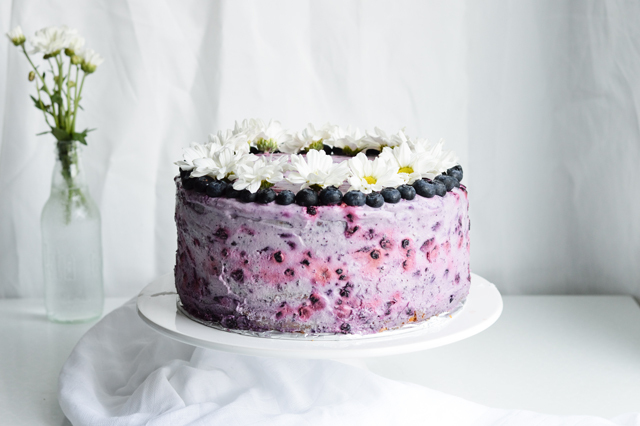 Very blueberry layer cake for when you really want ALL the blueberries! Oh, I made a cake. Just a short time after I told you about how I don’t like to bake when it’s hot outside. Which is still true, but, ohhhh damn, I just knew I wouldn’t be able to stay away from the oven. I’m stubborn. Probably less now than I was when I was younger, but I still am. 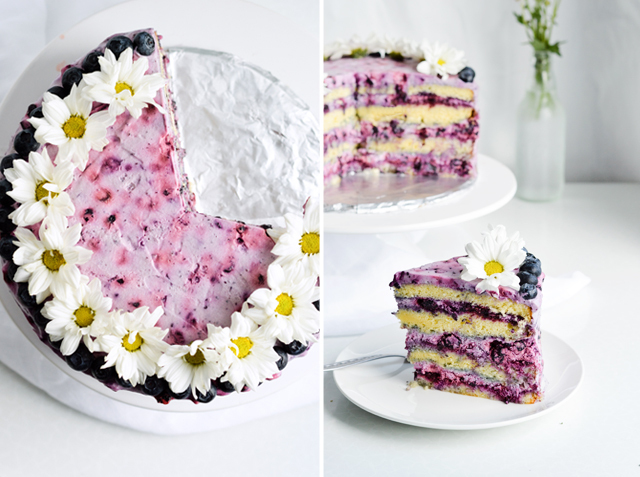 And when I want something, like homemade over-the-top blueberry layer cake, well I just have to have it. Who cares about sweating in the kitchen (well, I do care a little), doing a ton of dishes, when you get a piece of blueberry cake in the end? Or two? It’s worth it. It was also our anniversary week, when I made the cake, because I thought doing something special like this would be fun. We don’t have dessert like this one every day. When it comes to cakes I have certain preferences. 1. I’m not a fan of buttercream. I apologize to all the fans of buttercream, because I don’t know if I’ll ever share any buttercream recipes on here, but I just really don’t like it. Maybe I haven’t tried a good buttercream cake yet, but so far every time I had it, usually at birthday parties, all I could taste was the butter. And I just don’t see what good that does when a combination of cream and fruit (or chocolate) is more than enough? I am still leaving a little window open though, waiting for that perfect buttercream, so don’t give up on me yet. 2. I like my cakes moist, with a ton of filling. If it’s mostly cake and little to no filling, lets just call it a coffee cake and have it for breakfast. If it’s a special party cake, it has to have some filling in it! And by some I really mean a lot. My favorite cakes have more filling than actual cake, or at least reach that 50-50 ratio, and I’m not changing my mind about that any time soon. 3. And then there’s everyone’s favorite question – chocolate or fruit cake? I can’t decide on that one. I know many people have their preferences and Rok usually picks a chocolate cake, but I like both options equally. It all depends on what I’m in the mood for. Lately it’s been more fruit. While I’ve always loved strawberries, I’m beginning to realize I really, really love blueberries, probably more than any other berry. And so they were a natural choice for the first proper cake recipe EVER on this blog. This cake is soft, like the softest pillow in the world. It is rich and moist, but not too dense, thanks to the sour cream in the batter. 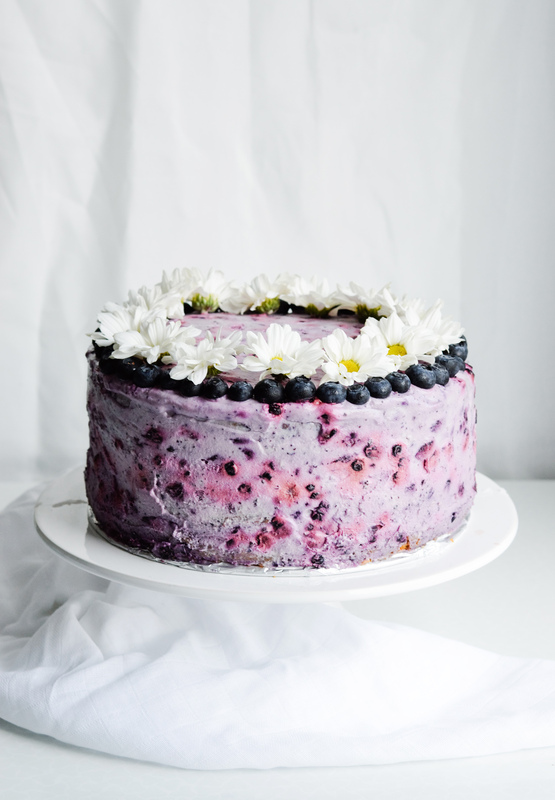 The cake layers are brushed with blueberry sauce and filled with a rich blueberry whipped cream mixed with mascarpone cheese and lemon zest. 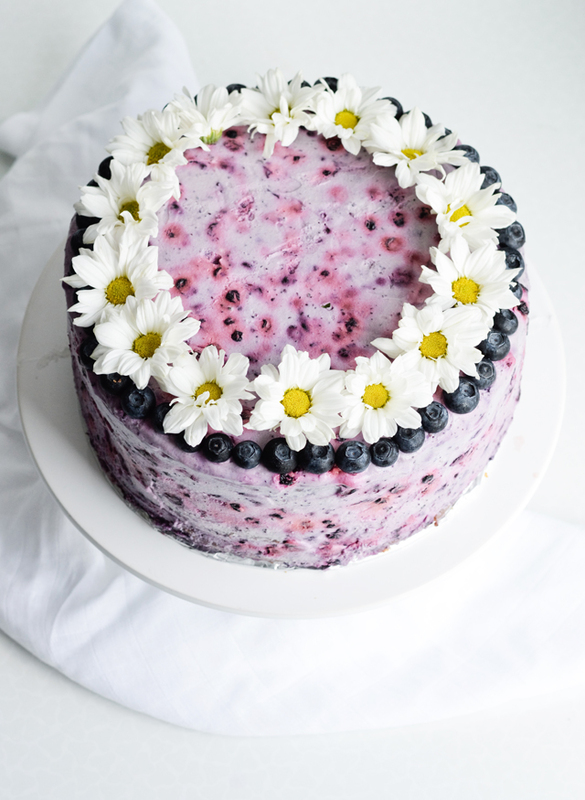 This cake smells like summer, a blueberry summer, and its color matches that of a dreamy lilac hydrangea. 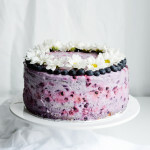 Recipe makes one 9-inch creamy blueberry layer cake, that is wonderfully rich and moist. It can be easily cut into 8 pieces, or more. Butter two 23×5-cm (9×2-inch) cake pans, line the bottoms with parchment paper and sprinkle the sides with flour. Set aside. (Look at notes if using just one pan.) Preheat the oven to 180°C (350°F). 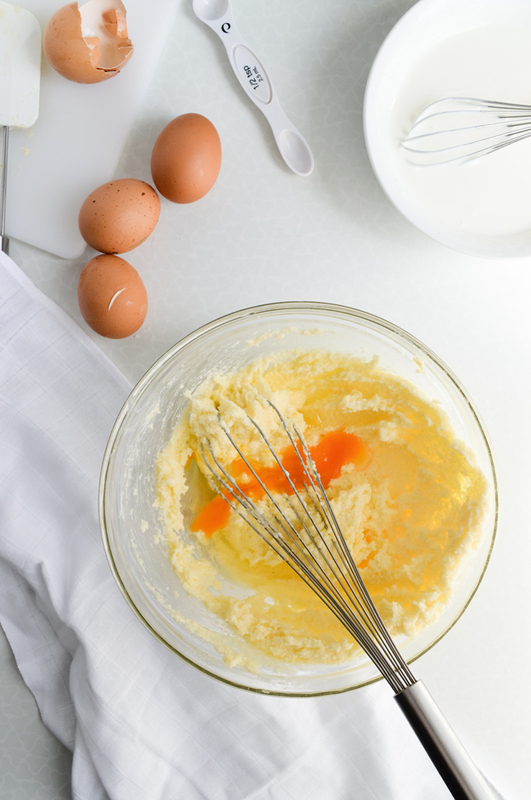 In a medium bowl, whisk together the flour, salt, baking powder and soda. Set aside. In a small bowl whisk together the milk and sour cream and set that aside too. In a large bowl (or in your mixer) beat butter until creamy and fluffy. Gradually add sugar and beat until incorporated. Add eggs one at a time, beating well after each addition. Lastly whisk in the vanilla paste. With the mixer set on low, or by hand, alternately add the flour and milk mixtures, starting and ending with flour (so you add flour – milk – F – M – F). Divide the batter and pour it into the prepared pans. Smooth the surface with a spatula and bake each cake for 25-30 minutes or until the cake is golden brown and a toothpick inserted in the center of the cake comes out clean. Cool cake for 10 minutes, then remove it from the pan (run a knife around the edges, invert cake onto a plate, remove parchment paper and then invert again on a large plate). Cool completely. Combine all the ingredients in a saucepan set over medium-high heat. Bring the mixture to a boil, stirring occasionally. Cook for a few minutes. The water will become purple just as the blueberries, it’ll thicken a bit and the blueberries will be soft. Remove from heat, set aside and cool completely. In a large bowl cream together the mascarpone and lemon zest. Set aside. Using an electric mixer, beat the cream with sugar on low-medium speed until soft peaks form. Add the vanilla paste and whisk until incorporated. Slowly fold the whipped cream into mascarpone mixture just until incorporated. Then fold in the blueberries (use a small whisk to gently stir them in). First level each cake (if needed) and split each cake layer in two, so you get 4 equal layers. Put the first layer on a large plate and brush some blueberry sauce over it. Spread 1/3 of the filling over the cake. Repeat with two more layers. Cover with the last, 4th, layer. Transfer the cake to the fridge and let the filling set, while you make the frosting. TIP: Use a 9-inch cake baking ring when filling the cake to prevent the filling from coming out the sides. Remove the ring before your frost the cake. Whip the cream until soft peaks form. Fold in the melted chocolate and blueberries, gently whisk until incorporated. Spread the frosting over the cake, starting at the top and then brushing it down the sides. This is done easily with a frosting spatula. Chill cake in the fridge until frosting sets, then decorate and chill until you are ready to serve. Cake keeps, covered in the fridge, for up to 3 days. I’m using wild blueberries for this recipes. They’re smaller, with a deeper color. If you can’t get wild blueberries, use cultivated instead, but crush them a bit before using, so they release some of their color. Recipe for cake layers adapted from Joy of baking. If you only have one pan, divide the batter, pour 1/2 into a pan and bake that cake first. 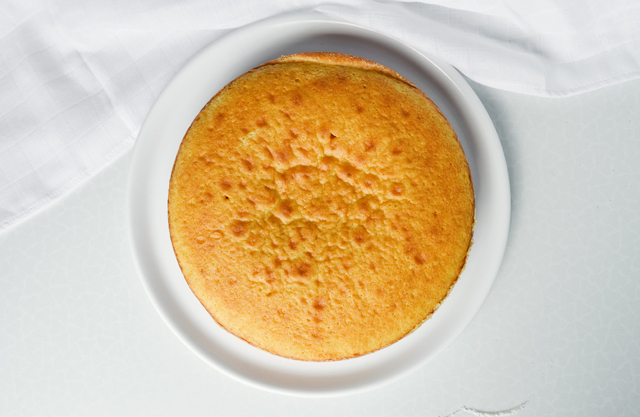 When the first cake bakes, remove it from the oven, let cool for 10 minutes then remove it from the pan. Wash the pan and prepare it like you did the first time (butter, line bottom with parchment paper, flour the sides). As the first cake bakes, keep the second half of cake batter in the bowl, covered with foil, at room temperature. When the cakes are baked, cool them completely, then wrap each cake in plastic wrap and place in a ziplock bag. Keep cakes on the counter, at room temperature, overnight, and split into layers + assemble the cake the next day. The cake stays wonderfully moist. For longer storage, keep the uncut cakes well wrapped in the freezer. Blueberry sauce can be made ahead too. Once cooked, put it in an airtight container or a covered glass jar and store in the fridge for up to a week. Martha Stewart has a great video on how to level and split a layer cake. this is fantastic!!!! Pinned and I will be sharing at Katherines Corner tomorrow. I invite you to stop by an d share your wonderful blog at my blog hop too. Hugs! You’re right Hannah! Thanks for pointing that out, has to be the worst typo I ever made. I fixed it now, the correct weight is 385 grams. This looks amazing. Can I use the same recipe to make a 2 layer rectangular cake? e.g. in a 9×13 pan? There are really two options, depending on how tall you want the final cake to be. My recipe calls for 2 round 9-inch pans, but the same amount can also fill up one 9×13 pan. You can pour all the batter in a 9×13 inch pan, bake it, cool it and then split it into 2 to get a layer cake, but it won’t be a very tall one. For a 2 layer cake with thick layers that don’t require cake splitting, etc. you do need to double the recipe. That will make a lot of batter, so you can also just do one batch of batter as I have it written in the recipe, pop it in the oven and as that bakes you can make another one. Also keep in mind that a cake of this size can take a little longer to bake, so keep an eye on it and use a cake tester before you finally pull it out of the oven. As far as the filling goes, I think one batch is enough for a 2 layer cake, however you can always adjust that to your taste / needs. Thanks, Alice! It’s for my son’s birthday party and we have about 30 guests. I was thinking of splitting the 9×13 pan into two…and hope that it would be at least 2″ tall with the filling. Does the batter rise much? Also where you can find vanilla paste? I checked our local superstore but didn’t see it. 2 inches is definitely doable! In fact I think it might even end up being about 2.5 inches tall, which will look really lovely once it’s cut. The batter does rise a bit. My store stocks vanilla bean paste in the baking section. If you can’t find it there, you can also find it in a baking supply store or even on Amazon. However, since you’re putting this in the batter, you can easily use vanilla extract instead. It’ll give you the same flavor, without the vanilla bean specks (which aren’t that visible in the baked cake anyway). I think extract is more easily available. And if you can’t find that, you can also scrape out the seeds from 1 vanilla bean pod and whisk these in the batter. Thanks Alice! I do have Vanilla extract so I’ll use that instead 🙂 I notice the recipe also calls for it in the filling. Can I use extract too there or does it change the consistency of the filling? You can definitely use it in the filling! While the paste is thicker than extract, there is hardly a difference in the end. I know it’s been awhile, but how did this end up turning out for you? I’d also like to split the 9×13 pan into two for 30 guests. Was it tall enough? It’s for my daughter’s third birthday. She wanted a purple cake with blueberries (favorite color and favorite fruit, so this is perfect!). Thank you so much for getting back to me and for the birthday wishes! and happy birthday to your daughter, Sara! Hi, Riley! The white chocolate isn’t that noticeable, but you can just leave it out. Add 3 tablespoons powdered sugar to the cream and whip to stiff peaks. Watch it carefully, so it doesn’t get ruined. 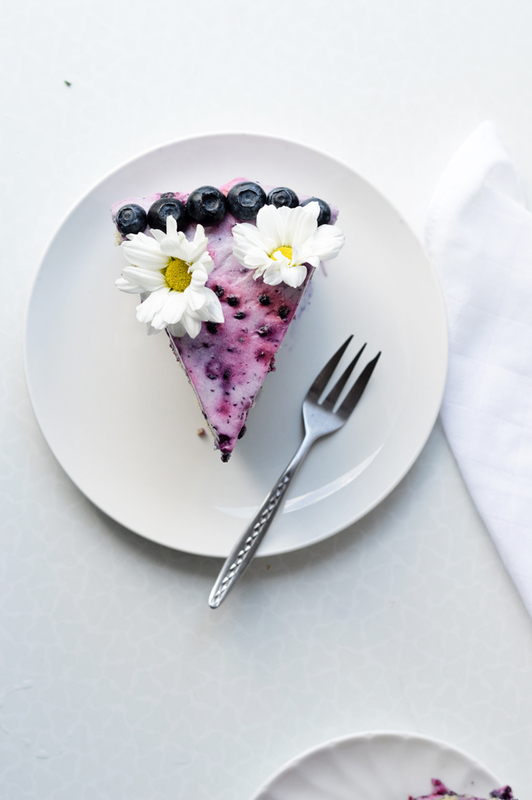 Then fold in the blueberries and frost the cake. 🙂 Hope this helps! Hi! I’m not really a baker and am not sure if this is an unusual question.. will this recipe be able to support fondant over it?? Or will the fondant be too heavy? not an unusual question at all! The cake itself can definitely hold the fondant, although you probably meant the frosting? So I have to say no. Using a whipped cream frosting with fondant is not recommended. I’ve never tried doing it, but I’ve done a lot of reading online and everyone advises against it. Apparently, the whipped cream is too wet for fondant, so you risk having fondant melt / soak into the cream and the cake will just end up looking bad. :/ So, I wouldn’t risk it. What I would do is I would make the filling as is, but I would frost the cake with simple buttercream instead, either vanilla or lemon flavored (or even blueberry if you can find the flavor). Once you chill the cake covered with buttercream, it’ll have a nice shell, hard and smooth, just perfect for fondant. Thanks so much for your advise! Wish me luck ! Definitely wishing you good luck! Hope the cake turns out how you want it too. 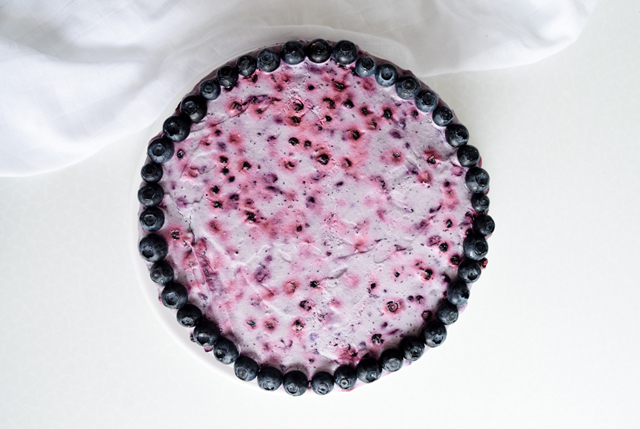 A friend of mine has a blueberry orchard and has asked me to make a cake for her using fresh blueberries. I noticed that your recipes calls for all frozen berries. 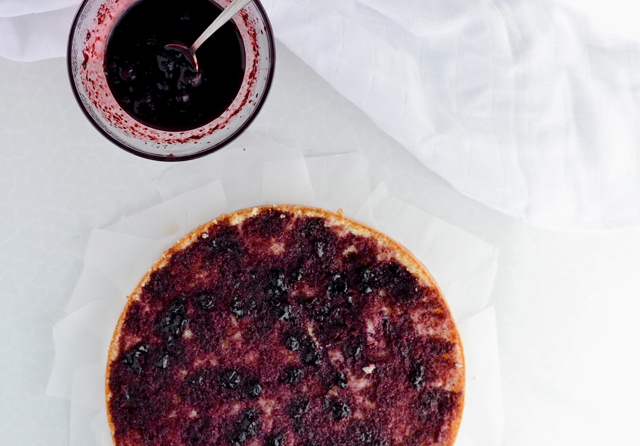 Have you tried this cake with fresh berries, and if so, did you have to make any adjustments? Thanks! Since you mention the orchard, I assume you have cultivated blueberries which are bigger and I find that they don’t naturally release much color. So when you’re making the filling and frosting, and if you want a deeper color, first try crushing the blueberries a bit. This will also make mixing easier, if the blueberries are bigger.